Rendering of Modera Observatory Park courtesy ARA Newmark. RedPeak's 1145 Ogden property. Image courtesy RedPeak. RedPeak's 1153 Ogden property. Image courtesy RedPeak. Denver-based RedPeak apartment management and ownership firm has announced that it is has added $13.85 million of new apartment properties to its portfolio. 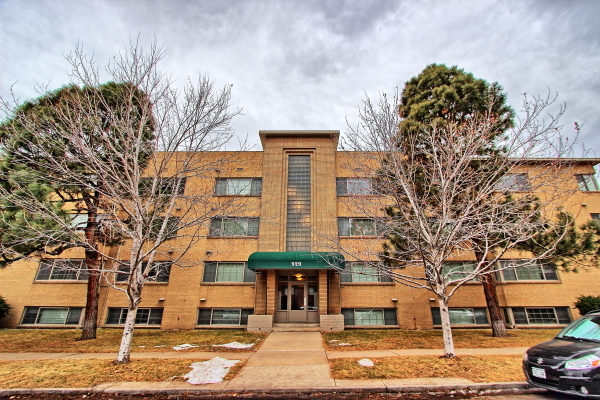 This includes the purchase of three apartments buildings in Denver's Capitol Hill neighborhood. 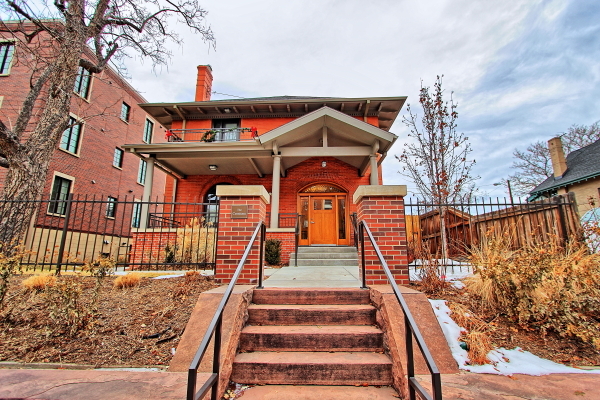 RedPeak paid cash for the three properties located at 929 Marion, 1145 Ogden and 1153 Ogden. Altogether this adds up to 66 units and the purchase averages out to $413 per rentable square foot. “These strategic and seamless acquisitions bring RedPeak’s ‘Urban Living Portfolio’ to 730 units in 17 buildings in Denver’s most walkable neighborhoods, and our total Colorado portfolio now consists of 2,445 units,” said Bobby Hutchinson, Investment Director for RedPeak. 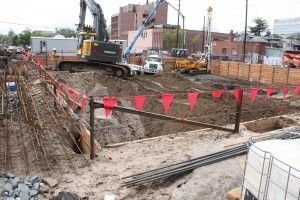 “In addition, we have recently broken ground on an eight-story, 115 unit apartment building located at 7th & Sherman in the Governors Park neighborhood, which we expect to deliver next summer, and have recently completed a substantial renovation of a 32 unit historic property at 970 Pennsylvania Street. We continue to look to expand upon our growing presence in Denver's highly desirable urban neighborhoods.” RedPeak states it is actively seeking high quality apartment buildings in Central Denver, and is willing to pay top market prices for assets that fit the company’s target criteria. RedPeak’s other recent purchases include the Coachman Apartments, 1075 Corona, 880 and 890 Dexter, 820 Dexter, 825 Dahlia, 805 Dahlia and 70 Clarkson. Construction of apartments at 7th and Sherman. May 2015. 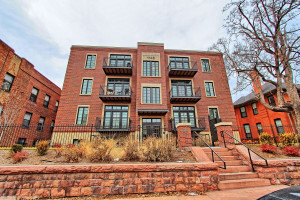 The One City Block project that was completed in 2014 in Denver’s Uptown neighborhood and The Seasons of Cherry Creek apartments are also among RedPeak’s Denver properties. 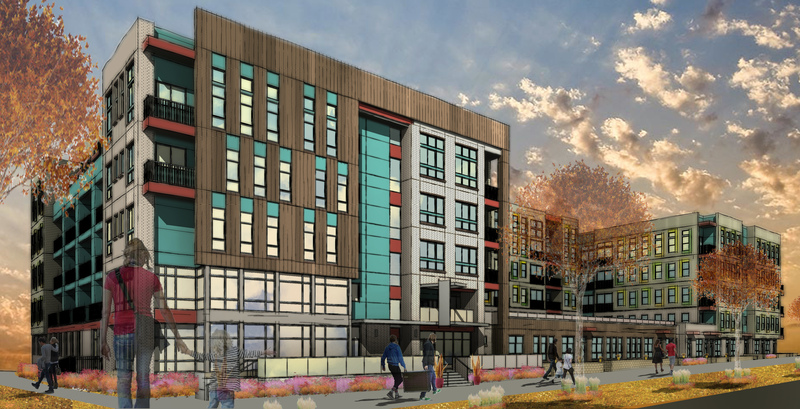 Currently under construction in Denver's Five Points neighborhood is The Wheatley, a luxury apartment building with a for sale town home component. This project is located at 25th Avenue and Welton Street. Craine Architecture is the architect of record for this project. The developer is Palisade Partners and the general contractor is Confluence Builders. Space for ground floor retail, 14 luxury for sale town homes, and 82 apartments comprise the project. 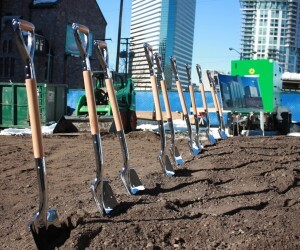 The apartments will reach 5-stories and a level of underground parking will be featured. The building will be located within Denver's Welton Landmark Design District and needed to meet the Landmark Preservation Commission approvals before construction could begin. 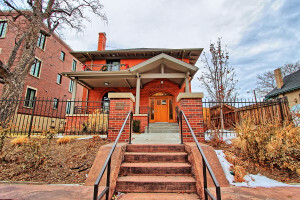 "Working with the Denver Landmark staff and the Commission, the building has been designed to be of its time, while incorporating elements that reference the rich context of the neighborhood. Although much of the building's massing, material selections, and detailing, were informed by the character defining elements of the neighborhood, perhaps the most unique element is the chamfered corner, used throughout the district as a way to address the public right-of-way, and provide for a welcoming building entry. The Wheatley celebrates the corner at the intersection of 25th and Welton with a chamfered condition, enhanced masonry detailing, and a suspended canopy, marking this prominent building entry," said architect Eric Bottenhorn of Craine Architecture. A rooftop deck and a fitness center will be incorporated into the project. Unit finishes will include quartz countertops, stainless steel appliances and and in-unit laundry appliances. Pricing for the for town homes will begin in the low $400s with square footage exceeding 2,000 square feet in all of the for sale units. One and two bedroom options will be featured in the apartment portion of The Wheatley. This project is being built on the site where the Phillis Wheatley Young Woman's Christian Association operated from 1916-1964. Phillis Wheatley was the first published African-American woman and first published African-American poet. The character of the neighborhood was considered during the design of the building. "The architectural fabric along the Welton corridor, is generally arranged into multiples of 25 feet, relating to the typical lot width. Historically significant buildings in the Five Points neighborhood, such as the Rossonian, have been organized with an obvious base, articulated with highly transparent storefront, a less transparent middle and a top that is often characterized by a projecting cornice. The Wheatley has been crafted to balance this contextually appropriate traditional language, with a material palette and detail refinement, familiar to contemporary architecture," said Bottenhorn. 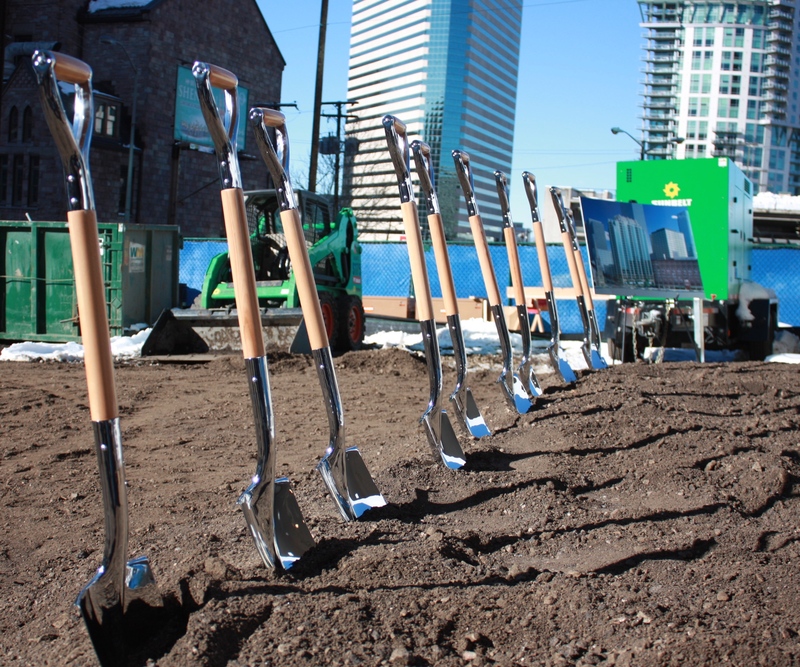 Simpson Housing, Novare Group, and Batson-Cook Development Company broke ground today on a 26-story luxury residential high-rise tower on the corner of Broadway and 18th Avenue in downtown Denver. 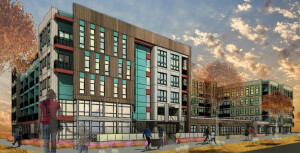 SkyHouse Denver is a mixed-use project featuring 354 apartment homes ranging from studio to two-bedrooms and 6,900 square feet of street-level retail space. The signature SkyHouse on the top floor of the building includes a club room, swimming pool and fitness center. The structure will also include vehicle charging stations and a dog walk with a dog washing station. The building is targeting millennials who are choosing to live in urban centers close to public transportation, employment centers and entertainment venues. 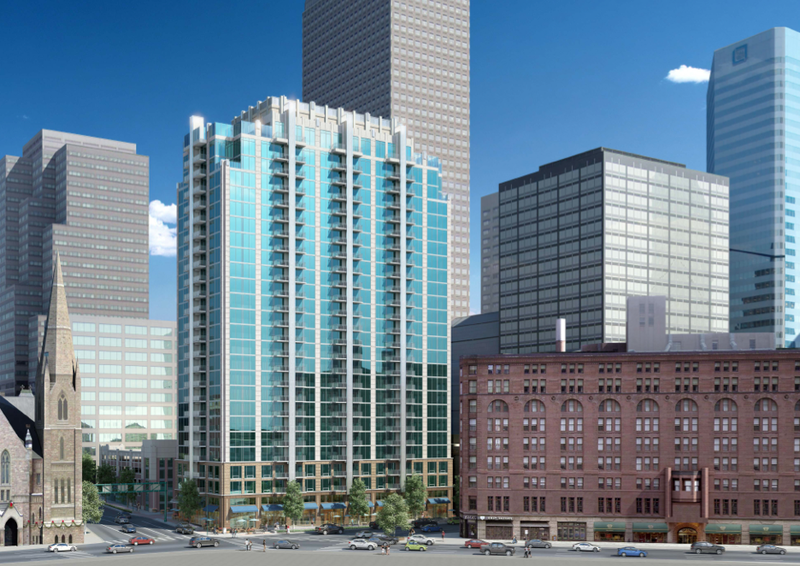 Rendering of the SkyHouse Denver residential high-rise at 18th and Broadway. Image courtesy Novare Group. Longtime Denver residents will recall the SkyHouse Denver site was home to the Cosmopolitan Hotel that was imploded in 1984. The site has served as parking lot for the last 30 years. 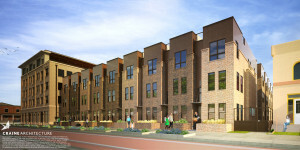 SkyHouse Denver is the 14th SkyHouse-branded apartment community in the United States following projects in Dallas, Houston, Austin, Atlanta, Tampa, Orlando, Charlotte and Raleigh. 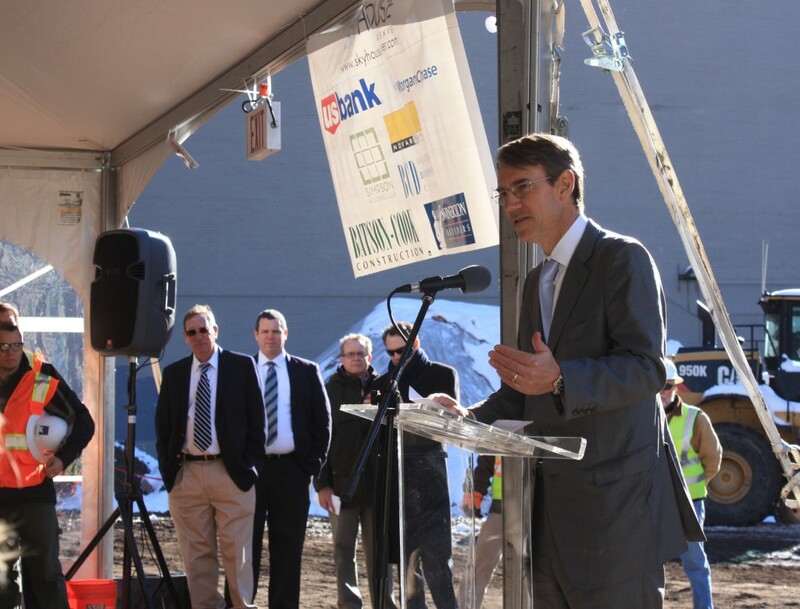 The sustainable building is being built to Energy Star standards. It is expected to be delivered in mid 2016. 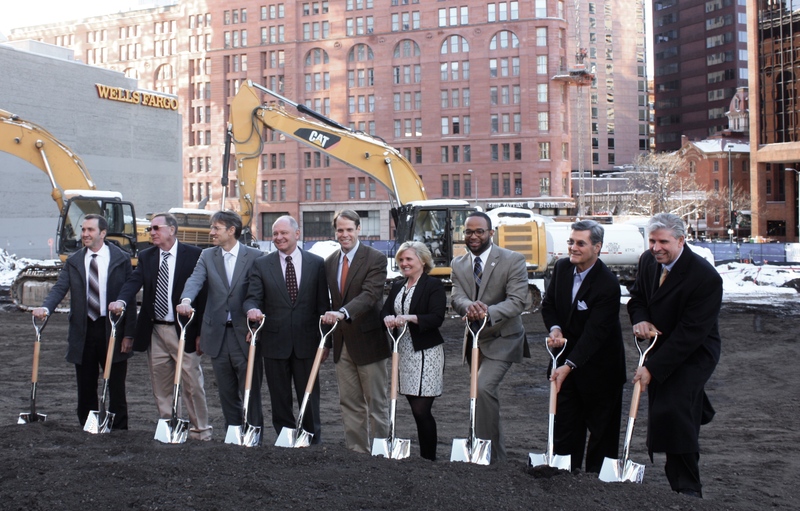 Members of the SkyHouse Denver development team and the City of Denver stand poised to break ground. 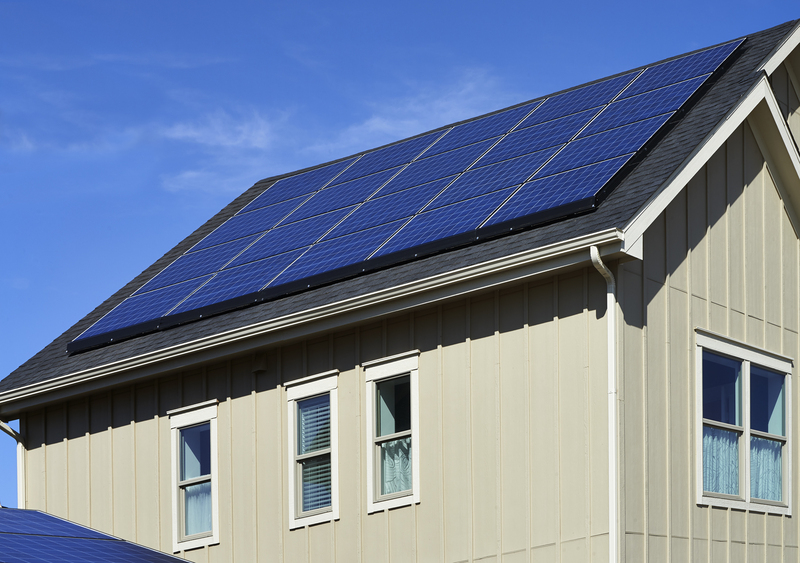 New Town Builders, a Colorado-based homebuilder won two awards for its Net Zero Energy home design at the National Association of Home Builders (NAHB) International Builders' Show (IBS). This year's winners were announced in Las Vegas at the annual IBS event. New Town's ArtiZEN Plan – designed to be as energy efficient as possible – was named Best in Green among Single-Family Production Homes by NAHB. This is the first year NAHB has given Best in Green Awards. "This year's group of winners truly represents the best of environmentally friendly building and remodeling," said NAHB Chairman Kevin Kelly, a homebuilder and developer from Wilmington, Delaware. "Not only are these homes beautifully designed, but they also take green building to the next level by using the most resource-efficient and innovative sustainable building practices available." The National Sales and Marketing Council (NSMC), a council of NAHB, also recognized New Town's ArtiZEN Plan with a Gold Nationals Award for Best Green/Sustainable Home Design. "We want to be a company that makes a difference," New Town CEO Gene Myers said. "The ultra-high-efficiency home world is relatively small, and it is a privilege to be recognized by our industry as delivering the very best in environmental science and design. More importantly, we hope that our example can lead more builders to deliver high-efficiency design at an affordable cost."